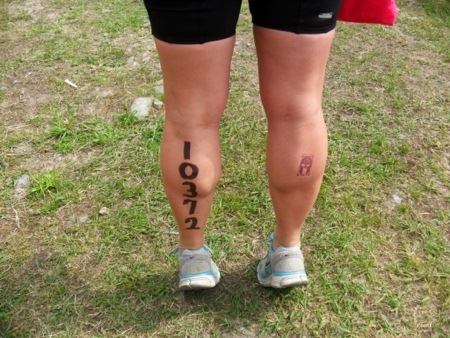 Race Recap-Spartan Sprint…..I Am A Spartan!! | Je Me Souviens-To Infinity & Beyond! 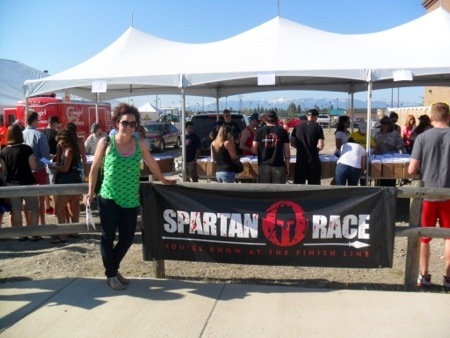 Race Recap-Spartan Sprint…..I Am A Spartan!! 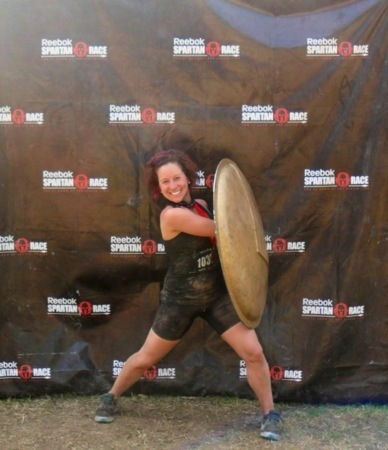 This weekend I participated in my first obstacle course/mud race—a Spartan Sprint. 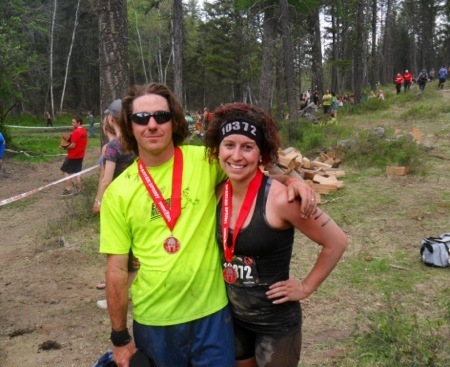 Last August, my husband and I were spectators when our sister-in-law participated in the Calgary Spartan Race. This is when we decided we needed to do one of these. 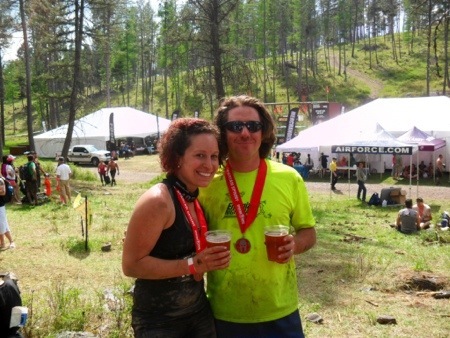 We travelled down to Bigfork, Montana, for our Spartan experience. And I speak for both of us by saying it was well worth the drive! 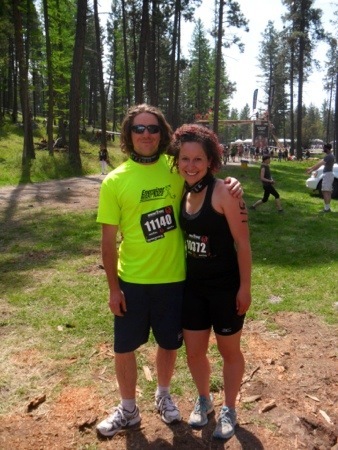 Upon arriving on Friday, we headed to the Sportsman & Ski Haus in Kalispell for our packet pickup. You were not required to pick up race materials the night before, but it was recommended. It was here that we got to also partake in food samples from local vendors, try our hand at the spear throwing, enjoy some live music, and have some local brews. Dan did the spear throwing twice—-the first time he attempted it like a javelin and failed. After watching some kids successfully throw it, he realized he needed to throw it like a kid—-just grab it and chuck it. It worked! Too bad the next day at the race it didn’t work like that! Saturday was race day. We were staying at Averill’s Flathead Lake Lodge. It was a dude ranch. Seriously. And trust me. I did my City Slickers “helllloooooooo” impression multiple times. The lodge was gorgeous. Honestly, one of the prettiest locations I have ever been. We had a fantastic breakfast that morning and headed out to our VIP parking at 10:30 am. Since we already had picked up our bibs and headbands the night before, we proceeded to the “marking station”. This is where they branded us with permanent markers and stamps, writing our heat time and bib numbers anywhere and everywhere. Since our heat wasn’t until 1:15 we had plenty of time to walk around the spectator grounds. Race heats were every 15 minutes until 1:30. Approximately 250 runners were in each heat. The guy working the start line was really great at pumping up each group as they started off. Immediately after the start you would hit your first mud bog and up the steep inclines you would go. This course was incredibly hilly—I would dare say mountainous. There were parts where you simply couldn’t run because you had to hike through brush and debris, over rocks and stumps. The views in parts of the course were absolutely breathtaking. Totally picturesque views of Flathead Lake. But, no time to stop and gawk! 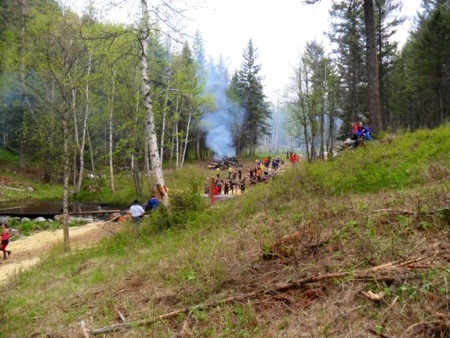 The obstacles that we had a glimpse of beforehand were the rope climb, sand bag carry, cargo cross, over/under log bridge, gladiators, spearman, barbed wire, slip wall and fire jump. 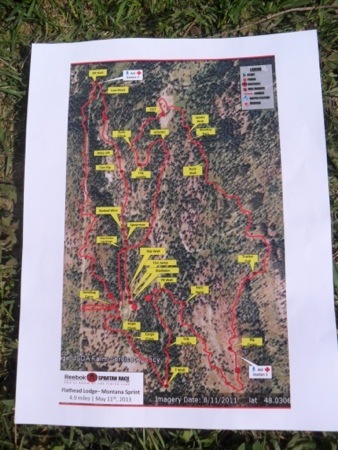 Below are some photos of the spectating area and parts of the courses that were visible. Finally our 1:15 heat began! Dan and I set a plan that we would stick together, as some of the obstacles needed him to be with me for help. We were also going to stick with my running pace when we could run and our goal was to do it in under 2 hours. Yes, the course was 4.9 miles. And yes, I can run nearly 5 miles in around 45 minutes on a normal workout day. 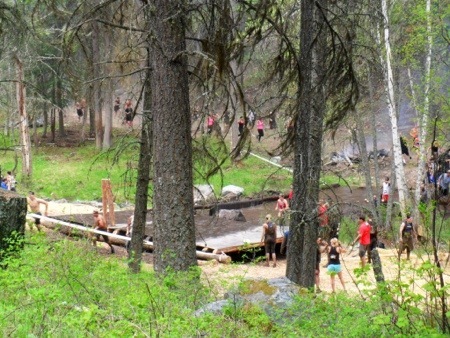 But this would prove to be not your typical 5 mile jog in the woods. Any of the climbing walls we reached Dan would go on the ground and I used his back as a step. It really helped—but him calling me stumpy didn’t! Being 5’3″ is tough for this race! If you cannot complete an obstacle you must do 30 burpees to buy your way out of the obstacle. 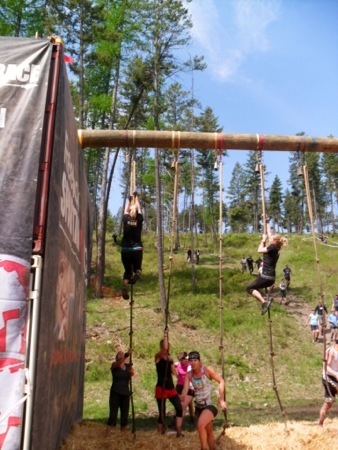 I unfortunately had to do three sets, as I did not complete three obstacles. The first one I should have been able to, and that was the monkey bars. But when I grab the first bar and contemplated swinging, my hands were so slippery I had to drop. I also struggled and got most frustrated with the rope climb. Dan was used as a ladder again to get me hoisted up and I got all the way to just below the top knot, but after three tries of getting my legs up to this pinnacle, I had to slide down. Pretty much crashed into Dan. Both of us did not get the spearman challenge either. You only got one shot, so that is what made it really tough. We finished together at 1 hour 50 minutes 6 seconds. We were both very happy with this! Dan could have probably shaved off ten minutes if he did not wait for me to do the burpees the two times and for me to finish obstacles, but he did say he thinks the breathing time he got as I was completing stuff really helped. He did give me a hard time about me only having 1 speed, as I wasn’t ever “sprinting” but I was doing my half marathon pace. Oh well, I was nervous about running out of fuel! With every Spartan Race being a new and different course, you won’t be able to try and beat a time you got from a previous race. But that is ok—-many of the obstacles are the same from race to race, so my goal the next race I do is to succeed in the obstacles I could not complete. 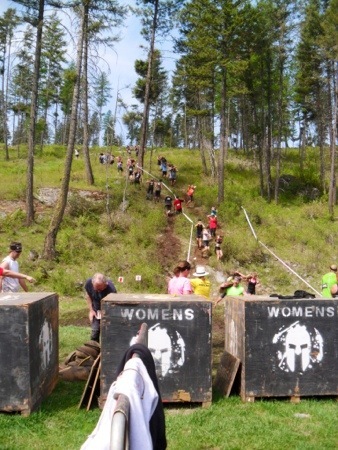 A co worker and I are registered for the Super Spartan, an 8 mile race, in September in Red Deer. That race will present different challenges than the one in Montana, as the running distance will play more of a part. There will probably also be additional obstacles! This race was all about completion and just having an awesome experience. I couldn’t help but wonder if my dad would have been all over this type of race and how he would have done. i know the long distance running wasn’t his thing, but most of those obstacles he could have just torn through! I did not do any specific training for this race other than my running, but now I know what I need to work on for September. So if any of you see me at the playground with a bunch of five year olds going across monkey bars and doing burpees, you know why! 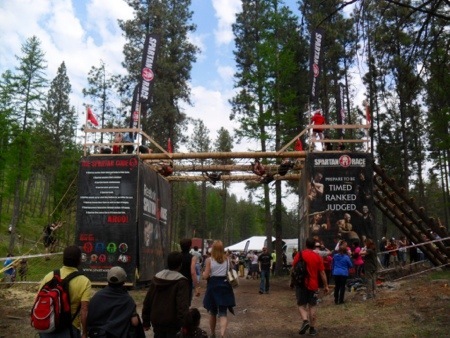 Pingback: Spartan Race Montana 2014—We Loved it so Much, We Came Back Again! | Je Me Souviens-To Infinity & Beyond!